The SCORCH system consists of intelligent UAS autonomous behaviors and an advanced user interface that allows a single operator to effectively control up to three UAS simultaneously. 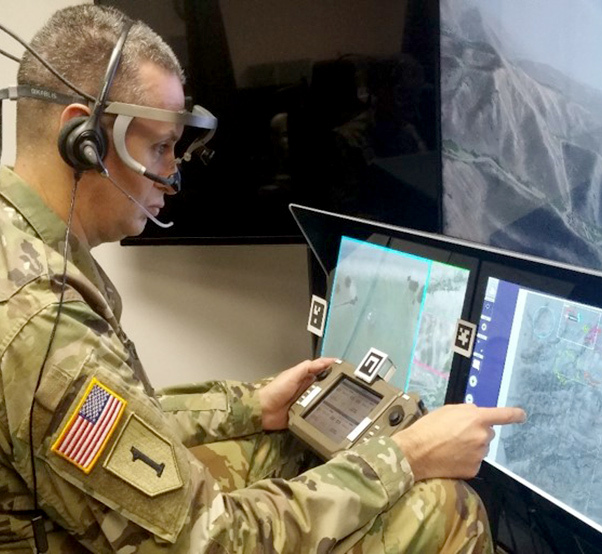 The Aviation Development Directorate has developed a system enabling an air mission commander to manage multiple unmanned aerial systems simultaneously, resulting in faster completion of mission tasks without increasing operator workload. The program is called Supervisory Controller for Optimal Role Allocation for Cueing of Human Operators, referred to as SCORCH. Manned-Unmanned Teaming operations, also known as MUM-T, are the synchronized employment of manned and unmanned air and ground vehicles, robotics, and sensors to achieve enhanced situational understanding, greater lethality and improved survivability. 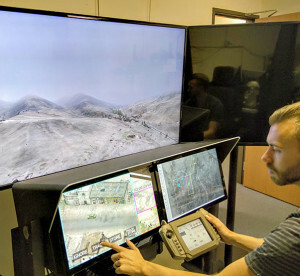 ADD, part of the U.S. Army Aviation and Missile Research, Development, and Engineering Center, oversees the development of new autonomous behaviors to ensure they are relevant to the Army’s MUM-T concept of operations. These autonomous behaviors support the project goal of expanding the MUM-T mission from manually controlling a single UAS to supervising multiple semi-autonomous UAS from a manned aircraft crew station, without compromising the operator’s primary mission. “The AMC delegates control of mission tasks to one or more UAS. The SCORCH system executes the tasks, notifying the AMC when critical decision points are reached,” said Taylor. Col. Steven Braddom, Director of the Aviation Applied Technology Directorate, evaluates the SCORCH system, which manages multiple unmanned aerial systems simultaneously. “SCORCH provides a unique synergistic integration of recent technological advances in the areas of human/machine interaction, autonomy, and cognitive sciences into a cohesive warfighting system,” explained Dr. Amit Surana of the United Technologies Research Center. 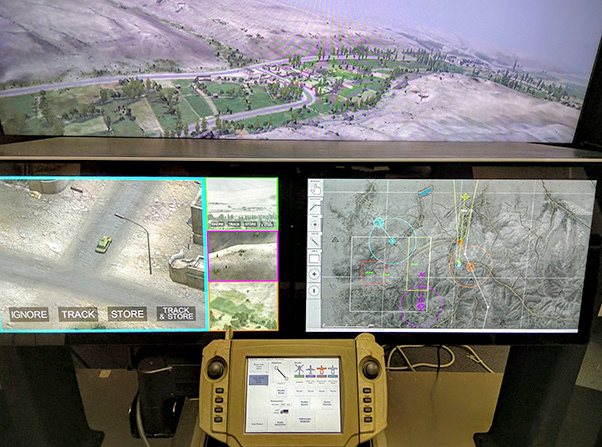 The interface was optimized for multiple UAS control, and features a glass cockpit with touchscreen interaction, a movable game-type hand controller with its own touchscreen display, an aided target recognition system, and other advanced features. The SCORCH project began in August 2013, intending to demonstrate an Army-relevant application of two previous basic research efforts funded by the Institute for Collaborative Biotechnologies in Santa Barbara, California. UTRC has partnered with ADD and assisted in the integration of the SCORCH system into the Army simulation environment. During recent experimental evaluations, 16 Army aviators completed two days of training, testing, and interviews to evaluate the SCORCH system. 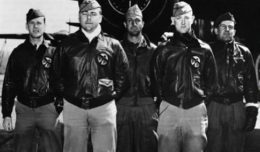 The ADD team recorded results that revealed the aviators adapted quickly to the change in mission execution, from direct control to supervision of automation. The experimental results successfully demonstrated that the SCORCH system improved situational awareness and mission performance without increasing workload. “To date, we have completed two rounds of development and experimental evaluation in our simulator located at Moffett Field, Calif.,” Taylor said. “We are currently working on revisions based on feedback from the first two experiments, which will be tested in a higher fidelity simulator currently being built at the AMRDEC Systems Simulation and Development Directorate facility at Redstone Arsenal, Ala.” The program is scheduled to conclude in May 2018.